But of course, The Farm! 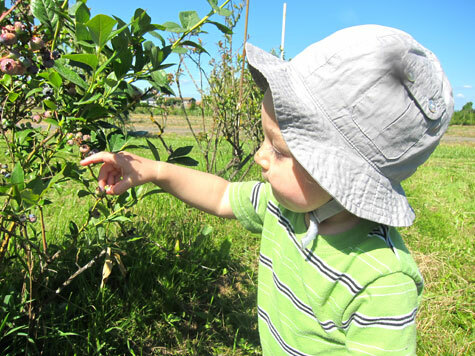 A few weeks back Waits and I were invited along on a berry-picking adventure with another vegan family. 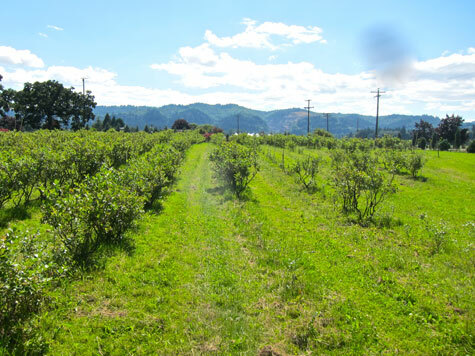 I’d only been to a “u-pick” farm once before, many years ago, and so I was super excited to explore Bella Organics, one of the few organic u-pick farms in our area. 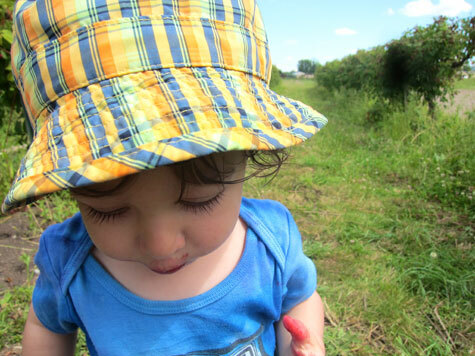 I thought that it would be all about berries, and sun and fun, and hanging out with another vegan mama and watching our little rascals get rascally down in the berry fields. Little did I know what I would discover out there . . . 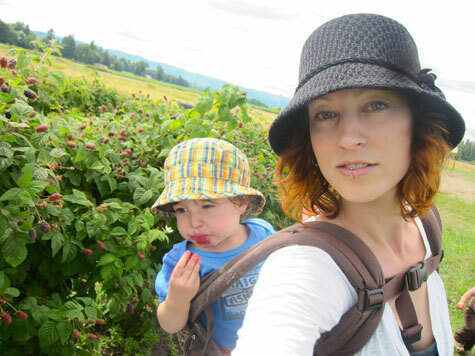 The first time out we went straight for the marionberries. These suckers are hybrid blackberries that were developed right here at Oregon State University. They are huge, and they are juicy, and they are all sorts of delicious. Waits did less picking, and more munching. 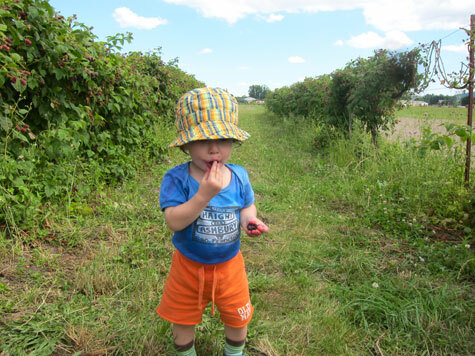 As an aside, I’ve made it a habit of asking the farmers to charge me for an extra 1/4 pound of berries, which is probably really high but it makes me feel much better about the number of berries that find their way into my little buddy’s mouth. Probably a good tip for most parents! It was awesome, the berries were awesome, and good times were had all around. But here’s the thing: at the front of the farm, where you pay for your haul, there’s this farm stand . . .
Cherries, Blueberries, Raspberries, Blackberries, Strawberries, Onions, Garlic, Kale, Collards, Taters, Broccoli, Beets, Heirloom Tomatoes, and on and on. All from surrounding farms, all organic, and SO CHEAP! Seriously, like, insanely cheap. Organic kale in the stores around here is $2.99/bunch. 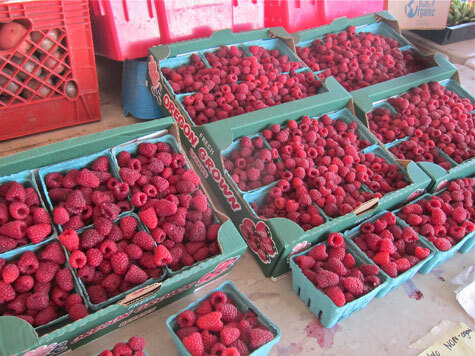 At the FarMar it drops to $2.50/bunch, and the bunches tend to be bigger. But at the farm? $1.50 a bunch! That’s half the price of store bought kale! I had no idea, and I certainly wasn’t prepared. So I grabbed what little I could, and I vowed to return as soon as possible. With a plan. 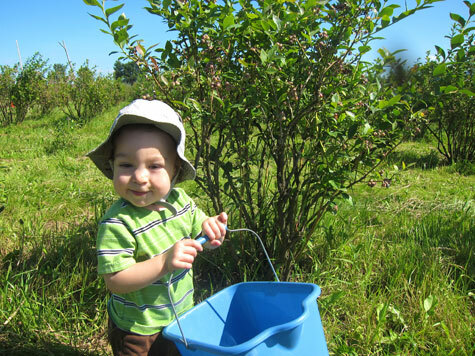 The following week we were back, with our same picking companions, hunting blueberries this time around. 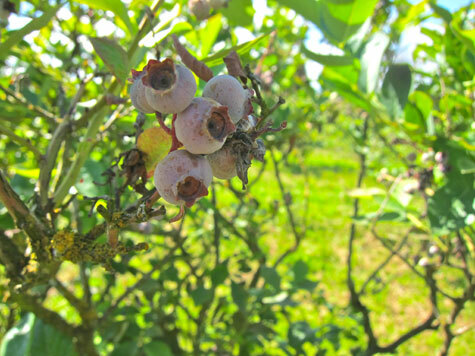 It was a gorgeous day on a gorgeous farm, and the blueberry fields were a long, lovely walk away. It was a little early in the season though, and the munchkins kept plucking unripe hard green berries (and trying to eat them). So we scrapped the berry-picking pretty quickly. Which was fine, since we had other things in mind . . . I had my sights set on broccoli. 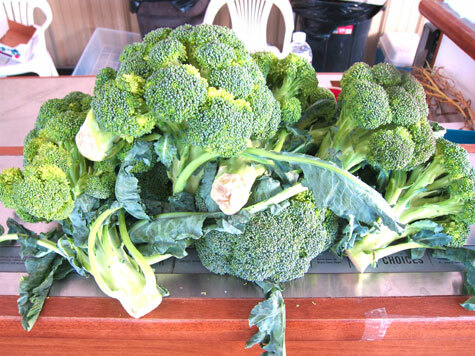 Amazing, organic, beautiful broccoli for $1.50 a head (not per pound, but per head, which was more than a pound apiece, easily). At that price? I wasn’t going to let that opportunity get away from me. I bought almost all of it! See, just a few weeks earlier I had been out on a walk in my neighborhood, and had stumbled across an enormous stand-up freezer for sale. Just what I’d been wanting! I bought it on the spot, and Damian picked it up when he got home from work. A little re-organizing in the garage, a little scrubbing with vinegar, and it was up and running and ready to go. I am SO EXCITED at the new possibilities for food preservation. SO EXCITED I TELL YOU! And the very first project was my broccoli. I washed it, trimmed it (juiced the stalks), and set it out on parchment paper to freeze. This step prevents the produce from sticking together and freezing into one huge block. Very important! Once it was frozen I transferred it to glass jars. Those are each gallon jugs, which I’d picked up for a crazy discount ($1.50 apiece; I nabbed 15) when my beloved neighborhood produce market and herb shop went out of business recently. 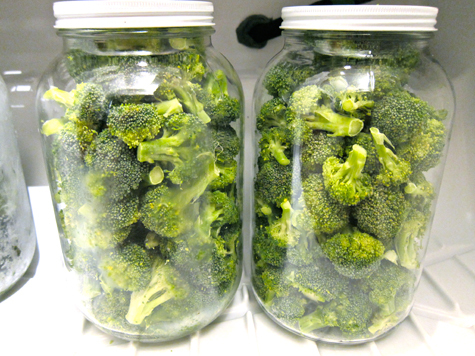 Two gallons – that’s a LOT of broccoli! Now, I’ll continue to buy and eat fresh produce for the duration of summer and fall. But when winter rolls around, I’ll be able to dip into my freezer stash for local, organic fruits and vegetables. Eating local foods, and buying food that’s in season, is great for the environment and great for the local economy and really great for your wallet! I’m excited to share more of my preservation adventures, as the summer continues to unfold, and the bounty keeps on rolling in. In the meantime, get thee to your local farm for the best bargain produce you’ve ever encountered! There’s Certified Organic and simply labeling a product as organic, even if it is not. It’s probably much better that you get it local either way, but the discount in produce is at the expense of uncertainty. Did you notice a size difference or greater degree of pest problem of the “organic” product vs. store organic vs. store/fresh non-organic? Sayward! I’m so excited for your freezing adventure to begin! I love “putting up for the winter” and am a farm freak! The u-pick produce stands are my favorite. Last summer I learned how to can and its opened a whole new world that I adore. An FYI about the broccoli – as I’m still experimenting I won’t pretend to be an expert but… I know you eat more things raw then my family does but I found with broccoli if I didn’t blanche and ice bath it before freezing, that when I went to use it, it had gone mushy. Yours looks way better though than mine did so perhaps mine first try was due to poor technique or perhaps some sort of freezer mishap, or the broccoli had just gone past ripe – so many variables but I’m just giddy about this new exploration and to hear your trials! This has me super excited! I’ve finally gotten into routinely learning new things to cook and I’m also preparing to garden next year! You are an amazing source of positive energy and simple creative ideas that most people don’t even consider! Would you believe I’ve never taken Nina to a u-pick farm? I need to do something about that! Berry season has passed here on the East coast…very sad! The broccoli looks amazing though! Can you freeze any type of glass jar or does it have to be a certain kind?!? I’d like to eliminate all plastics here at home! I never considered freezing things in glass. Is it better for freezer burn by any chance? Thanks for the idea! I swear you live in some magical, organic land. Beautiful pics. Again I’m left feeling soooo jealous! 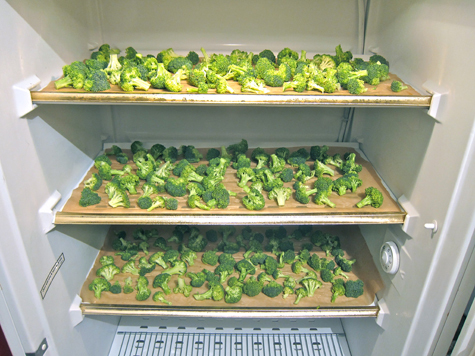 I’m so glad you’re talking about food preservation as I have tons to freeze or dehydrate or…something! Any super easy ideas for cucumbers? I thought about pickling them, but can it be done without a special can and without special boiling methods etc. Any other ideas? Love the pics. Boy did you score on the prices! Awesome! awww, sayward! i am so jealous! we dont have organic farms around us. maybe near Grand Haven where we are moving there will be some though! i just love your posts and pictures. what kind of camera do you use? curious because we are in the market for a nice one now that we have a little guy. so glad to have you back! I love picking my own food! My mom and I go almost every weekend to the farms out here. 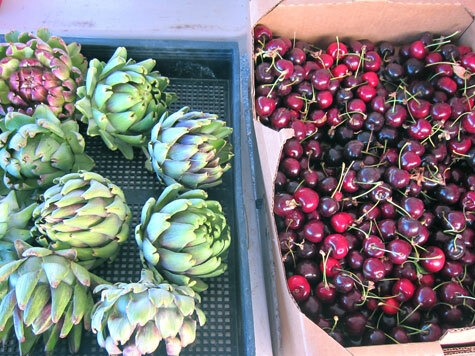 We usually hit up two different orchards and then a market with local noms. 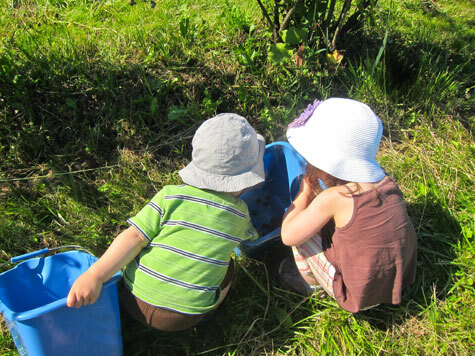 Another great idea for everyone is to look towards groups who are fundraising. 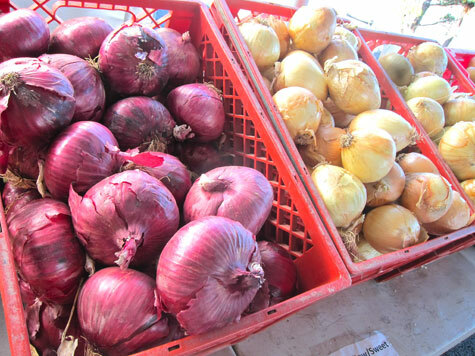 A local church group is fundraising boxes of fresh, local produce. 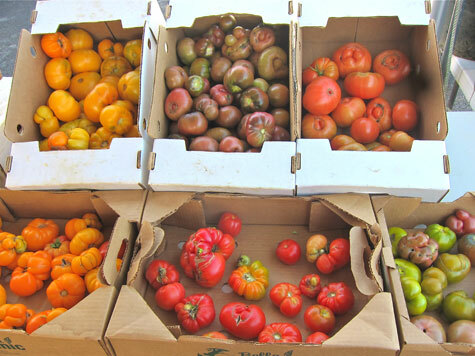 Its a great way to support an organization while getting local produce at a great price. I can’t wait for my peaches to arrive. My mom and I have a canning date planned! Like said, totally OT, but looking for guidance from someone who reads a LOT more than I do! I so want to go berry picking before it’s too late in the season! Hi M, my understanding is that it’s not legal to label something organic if it’s not. Farms around here are careful to say “spray-free” or “sustainable” if they lack certification. If something is labeled organic then I believe that it is. I think the bigger issue though, is that organic does not actually mean what a lot of people think it means. Oh no! I hope I didn’t ruin all my broccoli! I feel like I’ve frozen it straight before without issue, so hopefully I’ll be okay . . . we shall see come winter! There are u-pick farms for all sorts of produce though, not just berries. 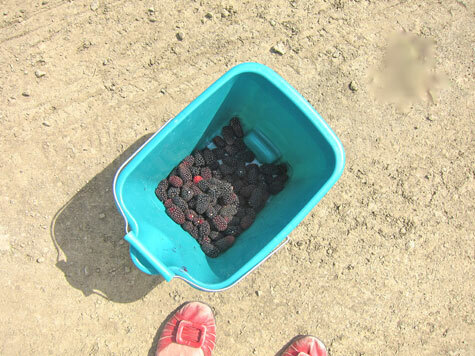 You may be able to go picking after all! You can freeze in any glass, and it’s so much safer than plastic. If you’re doing liquid just leave room at the top and wait until it’s frozen before you put the cap on – this will prevent cracking. Not sure about freezer burn, but I definitely feel batter about the a) sanitation, and b) toxins leaching into food. I really try to keep plastic out of my kitchen, wherever I can. HA! Not magic. Just Portland! I use no-poo (here) and I wash my hair once a week. The only conditioner I use is apple cider vinegar, once a week after I do the no-poo. I don’t notice a difference in color lasting, but my hair is healthier on no-poo than it has ever been in my life. It’s amazing and I friggin love it and I’m never going back to shampoo. That stuff is murder to your hair! You can ferment your pickles with no fancy equipment and no boiling mess! I have directions here. I know, I know! But I’m planning a huge trip to a pumpkin farm in the next couple of months, I think she’ll really love it. Those are taken with a little Canon Powershot, which I actually don’t recommend. Horrible color distortion, I really dislike that camera and we’re about to get a new one. But most of the pics on this site are taken with a Canon EOS 5D Mark II. It’s a pretty penny but damn, it takes good photos. If you want a really quality camera that will last you forever and will be able to capture your bubs in the best way, I *really* recommend the Canon Rebel. I have a bunch of friends who got one after they had a baby, and they are getting *amazing* photos. It’s pretty much the best you can get before stepping up into the next price bracket (like the 5D). Look for a Rebel refurbished or on craigslist, and you can get one for even cheaper. Luck! This is such a difficult topic.I cover it briefly in my book, but not enough to be able to call myself an expert, and really, I feel like I’d need to do a lot more research before making any real recommendations. Which, I do need to do. But right now I’m not qualified – sorry! I can tell you that if I am unable to breastfeed my next baby, this will be my order of operations: first, I’d do everything I could to get *some* breast milk, even if it’s only as a small supplement to formula. I would ask every lactating woman that I know (starting with the vegans), and try to get pump donations from friends. If that didn’t work then I would look into a milk bank. I know it’s super expensive but again, even a little supplement is better and has been shown to confer some of the benefits of breast feeding. Simultaneously, I would look into formulas. Choosing soy versus animal is a HUGE conundrum. That’s a personal choice. Primarily I would focus on the specs of each option. Must be organic. Must not have HFCS, or other added refined sugars. That sort of stuff. Again, I’d need to do more research to know all of the specific things to look out for. BUT! Good news – one of the Limbo employees has leased a space on 39th and Gladstone (right across from the Gladstone Pizza and will be opening a bulk herb shop in early September. Yay! As for how to go this direct route, if you don’t know where to go, ask your local midwives (the home birth type), or perhaps mothering.com forum participants in your ‘tribe’. I got to donate milk to a lovely family who appreciated my dietary lifestyle, and we’re also now friends. But I do have a broccoli question…I have tried to freeze it (I blanched it) and it turned out rubbery. Very rubbery. So I’m interested to see how yours is.